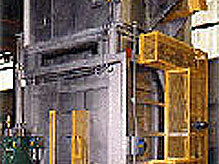 The oven shown is a CORE WASH OVEN, rated at 450°F, with a full load production capacity of 325 head cores per hour. This gas-fired oven features Coleman® Jet-Action® nozzles, a twin chain conveyor, and a variable frequency conveyor drive. The approximate overall dimensions of this unit including oven and twin chain conveyor are, 32 feet long X 7 feet wide X 12 foot - 6 inches high.